~/config/cache/HaikuDepot/ - Cached icons, screenshots, descriptions etc. HaikuDepot is the central application when it comes to managing your software packages. With it you can browse and search through package repositories and install, update and uninstall packages. By default, HaikuDepot starts up with a list of "Featured packages", software that's deemed interesting to many users. The Category pop-up menu lets you limit the list to individual categories like "Audio" or "Games". The Search terms text field filters the list to those packages that have all the entered (space-delimited) strings in their name or description. The checkbox to Show only featured packages can be activated to further filter the results in the set category or of the entered search terms. The Repositories menu of the menu bar determines which repos are being queried. "Local" packages are the ones that were installed from somewhere other than an online repo; maybe from a USB thumb drive or downloaded from some website or a package that you've built yourself. Like in any Tracker window, you can choose from a context menu which columns to display by right-clicking the column heading. A left-click sorts the list according to that column. Of course, you can rearrange the columns by dragging them to a new position. Active: The package is currently installed and ready to be used. Available: The package exists in that repository and can be downloaded and installed. If there are any dependencies on other packages, you'll be informed of that while installing and get the choice of downloading/installing all that's necessary. Pending / %: Pending is shown for a package that is queued for download/installation. While a package is downloaded, the progress is shown as percentage. Update available: There's a newer version than your installed one available. You can grab the dotted line between the packages list and the info area to vertically resize the packages list. At the bottom is an area that displays information on the package that is currently selected in the list above it. 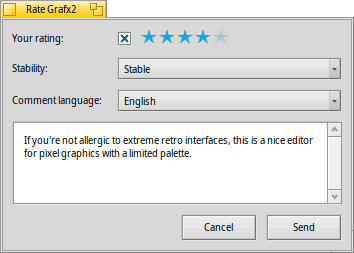 To the right of package name, author, rating and version is a button, that – depending on the current state of the package – lets you Install, Uninstall or Update it. If a package is already installed, you'll find an additional button there to Open the application. Below are four tabs: About, Ratings, Changelog and Contents. The second tab shows ratings and comments of users, if available. To the left is a statistic, showing the number of stars (1 to 5) the package got from how many users. In the middle are user comments with their nickname, the number of stars they gave the package and which version of the package they were rating or commenting on. You'll find more on how to rate a package yourself further down. Here you find a detailed history of all the versions of the package that have been released so far, if the maintainer of the package provides that information. The last tab shows all the files and folders a package contains. This only works for already downloaded packages. 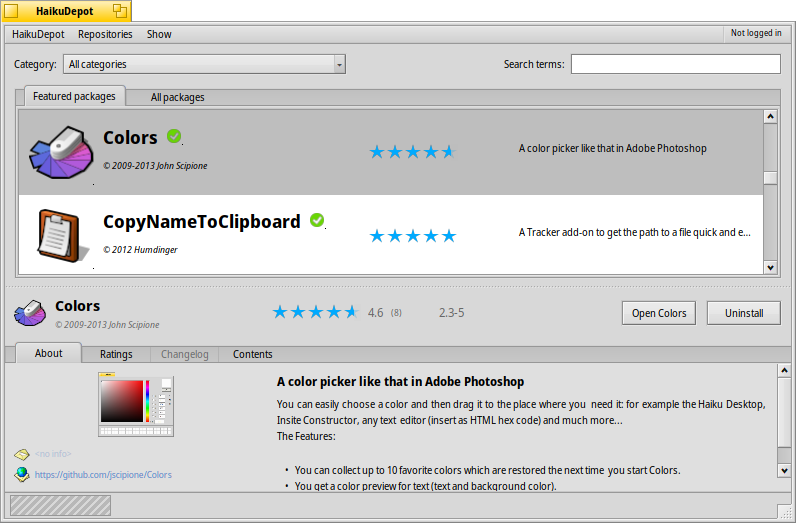 In the Tools menu at the top of the window, you'll find an item to Refresh repositories. This will request an up-to-date list of all available packages from the repositories. The second item is to Manage repositories.... It opens the Repositories preferences, to add/remove or disable and enable repositories. Check for updates... opens the SoftwareUpdater to search and install updated packages. 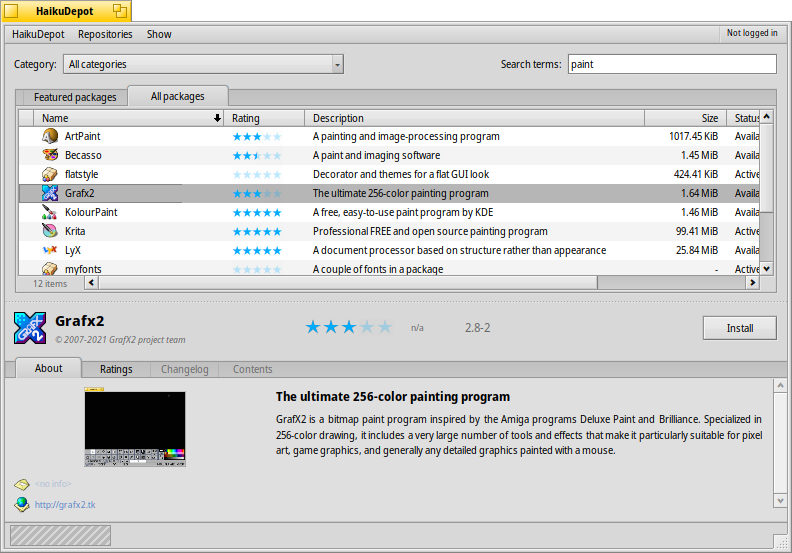 Under Show you can choose to also display Develop packages and Source packages in the packages list. For the normal user those are of no interest and would only clutter the list. They are important, however, for people who need the libraries, headers etc. of a package to develop and compile programs depending on them. Of more interest are the options to only show Available packages and Installed packages. 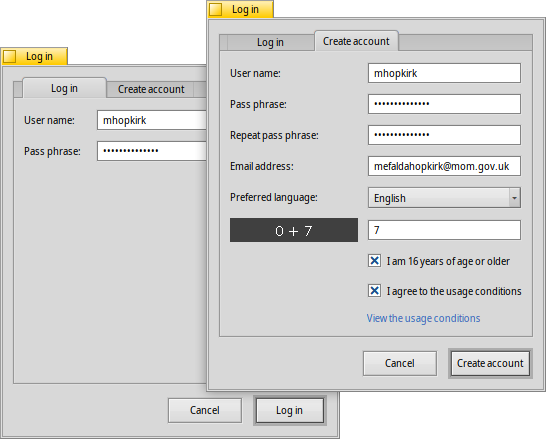 After logging in, the top-right menu of the HaikuDepot window will now say Logged in as (...), showing your user name. The menu now offers you to Switch account... or Log out. After you click Send the data is transmitted to the server. You may have to go to the Tools menu to Refresh repositories before you can see your changes. At any time, you can come back and edit your comment and re-rate it. You can also hide your rating from other users by deactivating the checkbox Other users can see this rating.